For additional information, refer to “Audio operation precautions” in this section. Place the ignition switch in the ACC or ON position and press the PWR (power) button while the system is off to call up the mode that was playing immediately before the system was turned off. To turn the system off, press the PWR button. Press the ENTER/SETTING button to show the Settings screen on the display. Turn the TUNE/FOLDER knob to navigate the options and then press the ENTER/SETTING button to make a selection. Bass, treble, balance and fade can also be adjusted by pressing the ENTER/SETTING button and turning the TUNE/FOLDER control knob to select the item to adjust. When the desired item is shown on the display, turn the tuning to adjust and then press the ENTER/SETTING button until the display returns to the main audio screen. If the button is not pressed for approximately 10 seconds, the radio or CD display will automatically reappear. This button can only be used for iPod® operations. 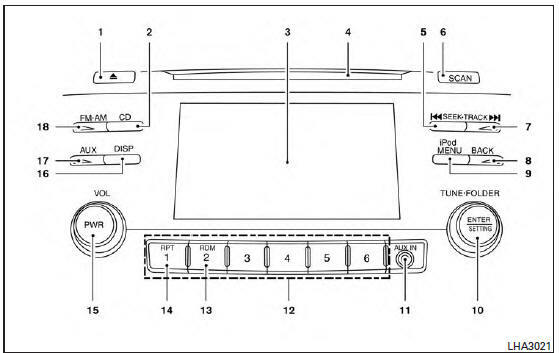 For additional information, refer to “iPod® player operation” in this section. The DISP (display) button turns the display screen on or off. Press the BACK button to return to the previous menu screen. Choose the radio band AM, FM1 or FM2 using the FM·AM button. Tune to the desired station using manual, SEEK or SCAN tuning. Press and hold any of the desired station memory buttons (1 – 6) until the preset number is updated on the display and a beep sound is heard. If a MP3/WMA CD with multiple folders is playing, turn the TUNE/FOLDER knob to change folders. Disc Random: all tracks on the disc will be played randomly. The AUX IN jack is located on the CD player. The AUX IN audio input jack accepts any standard analog audio input such as from a portable cassette tape/CD player, MP3 player or a laptop computer. Press the AUX button to play a compatible device plugged into the AUX IN jack. The AUX button is also used to switch the audio system to a source plugged into the USB connection port in the center console. When a device is plugged into the AUX IN jack while another device is plugged into the USB connection port, the AUX button is used to toggle between the two functions. For additional information about the USB connection port, refer to “USB (Universal Serial Bus) connection port” in this section. For additional information about the iPod® player available with this system, refer to “iPod® player operation” in this section. For additional information about the USB interface available with this system, refer to “USB (Universal Serial Bus) connection port” in this section.